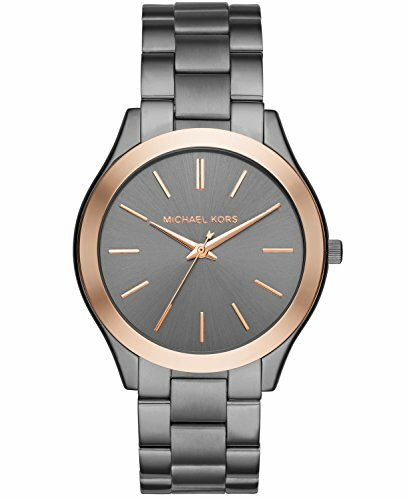 Watch Sizing Guide The gunmetal Michael Kors® Slim Runway watch is polished perfection. A classic three-link bracelet, rose gold-tone topring and monochromatic sunray dial with rose gold-tone stick indexes add up to a wear-with-everything timepiece that dresses up and down. Stainless steel case. Stainless steel bracelet with fold-over, double push-button release. Round face. Three-hand analog display with quartz movement. 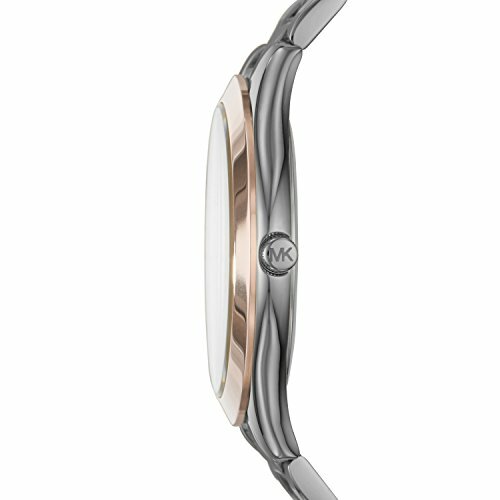 Dial features rose gold-tone hands and hour markers, minute track, and Michael Kors detailing. Chronograph functionality. Water resistant up to 5 ATM. Display case included. Imported. Measurements: Case Height: 42 mm Case Width: 42 mm Case Depth: 9 mm Band Width: 20 1⁄3 mm Band Circumference/Length: 9 1⁄2 in Weight: 4.8 oz This product may have a manufacturer's warranty. Please visit the manufacturer's website or contact us at warranty@support.zappos.com for full manufacturer warranty details.